Have you ever wondered how much water it takes to fill up the pool in the elephant exhibit? Are you curious about what the Zoo’s lions eat or how much a giant Aldabra tortoises weighs? Join the Zoo’s interpretive specialists and zookeepers daily throughout the park for Wild Encounters as they share facts and stats about Zoo animals. Beginning March 25, Fort Worth Zoo interpretive specialists and zookeepers will share amazing facts and stats about your favorite Zoo animals all throughout the park! Schedules are subject to change. Please check the clocks at each exhibit for accurate times. Some animal-related events may not occur due to weather (this includes cold temperatures). American alligator Pineywoods and Swamps, Texas Wild! 1:30 p.m. Raptor mews Texas Wild! Mountain lion and jaguar Mountains and Desert,Texas Wild! * The 4:30 p.m. Keeper Chat is available on Saturdays and Sundays only. 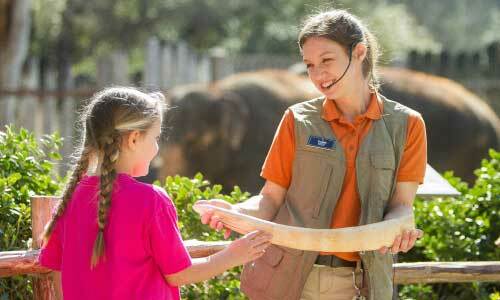 Get an up-close look at the mammals, birds and reptiles in the Zoo’s animal outreach collection. May 4 - June 1: Wednesdays, Saturdays and Sundays at noon and 2 p.m.
June 2 - Oct. 24: Daily at noon and 2 p.m.